Supports the following standards: ASTM D36, E28, AASHTO T53. Single, ring and ball method softening point apparatus set, including burner. 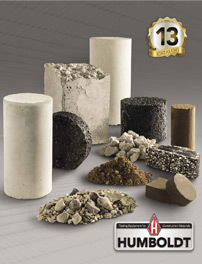 This set can be used for single determinations such as: asphalts, pitches, tars and most resins. Includes burner, beaker, support stand, 1 ring, wire gauze with ceramic center, thermometer clamp, 1 shouldered ring and stem with hardened steel ball. Order necessary ASTM mercury thermometer locally. Illinois law prohibits us from selling mercury thermometers.